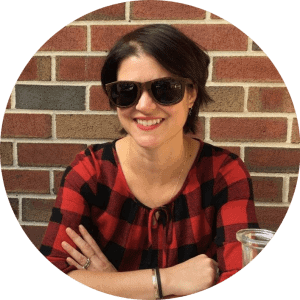 Today’s post is from Nicole Gulotta, a grantmaker by day and gourmet home cook by night. She pens the literary food blog Eat This Poem and spends as much time with her French bulldog as possible. She lives and writes in Los Angeles. For someone who plans her vacation itineraries around dining experiences, it was unsettling for me to have no lunch plans on the first day of my trip to Napa. It was a calculated decision, though. My husband and I would be starting our road trip two days after Thanksgiving, and not knowing what time we would be leaving my in-laws’ house, we decided to just see where the road took us. We arrived in northern California just past noon, and before we headed to wine country, where we’d be spending the next five days, we made the executive decision to stop for brunch before driving to our hotel in San Francisco. Oakland was close, so I quickly ran a Google search for “best Oakland restaurants” in my iPhone. 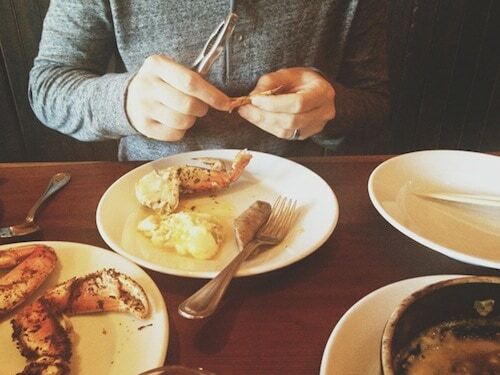 Camino was highly ranked, and after learning that the chef previously worked at Chez Panisse in Berkeley, I was confident that a fresh, seasonal cooking philosophy had accompanied him. Minutes later, I’d made a reservation on OpenTable, and soon we were walking downtown along Grand Avenue through piles of golden November leaves. I tend to believe every vacation should begin with a good cocktail, but my overwhelming hunger kept this from the forefront of my mind until we walked inside and a high-end coffee and cocktail bar greeted us. Camino’s bartenders and baristas meant business. I scanned the dining room as we were seated. It was filled with light, long communal tables, cozy brick walls, and an open kitchen where you could chat with the chefs on the way back from the restroom. Camino’s brunch menu offered the food you crave on a Saturday morning: homemade donuts, stoneground oats, poached eggs, and French toast. There were so many items we wanted to try that we ordered enough to share. In many circumstances, if you order five dishes you might love three, which still makes for a good meal, but we couldn’t stop gushing over every dish strewn across our table. 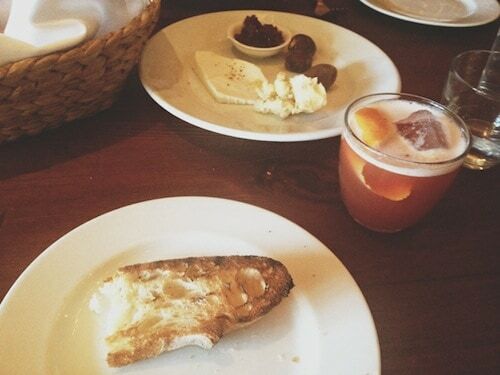 We went on to spend five memorable days in Napa, with stops in San Francisco, Mill Valley, and Healdsburg along the way, but our first meal set a marvelous tone for the rest of our trip. It turned out that being spontaneous was the best decision we could have made. Preheat the oven to 350˚F and place two ramekins on a sheet pan. Add one tablespoon of whipping cream and butter to each ramekin, then place it in the oven for a few minutes, until the butter is just melted. 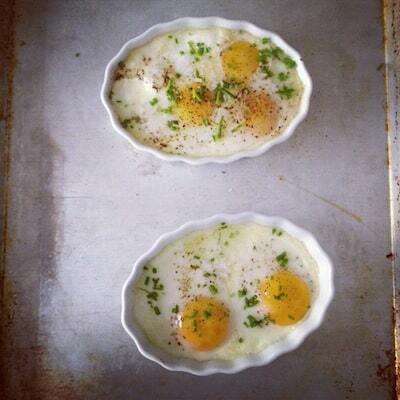 Crack 2 eggs into each ramekin, then bake for 10 minutes, or until the whites are just set. I recommend checking the eggs at the 8-minute mark. They can overcook quickly, so if the whites look just about right, pull them out and let the residual heat continue cooking them for the last couple of minutes. Top with chives, and serve alongside grilled bread for dipping.